Comic-Con 2018 is upon us, and once again I'll be making the trip to San Diego for the annual pop culture extravaganza. Will I take pictures? Yes, yes I will, and I'll slowly share them with you for what will seem like an eternity. If you're coming to the show, you can find me at two locations throughout the week. I'll be in the small press section, booth M-06, sharing a booth once again with the wonderful Jennie Wood. We'll have new copies of Flutter, vol. 3 for sale! I'll also have the brand new All-Star FUBAR, Honcho, The Tick, and some pins as well. I'll also be spending some time with Ian Nichols at the New England Comics booth, #1807, on Thursday through Sunday. 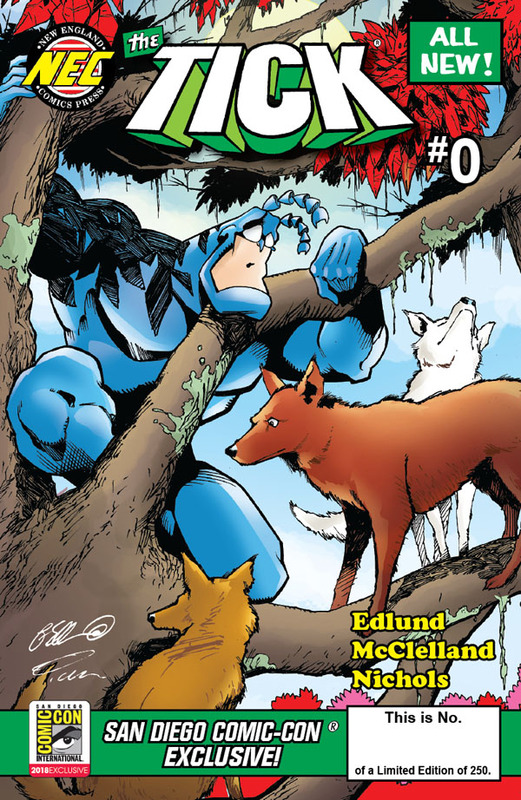 Check out all of the Tick exclusives on sale, including a brand new comic, made just for the show (they put my name right under Edlund's, everyone). You'll also find me running around like a maniac, trying to do everything possible, buying more than I should, and eating at the Taco Truck. The Taco Truck! I can't wait to get a burrito from there. Have a good show, everyone! After years of reading and re-reading a stack of my dad's old comics, I started reading DC and Marvel titles in earnest in 1992, when I was 10 and 11 years old. One of the first new books I picked up was Spider-Man #26 (with a sweet 30th anniversary hologram cover), and the "Death of Superman" story a few months later got me hooked, apparently for good. I'm pretty sure that my mom bought me that Spider-Man issue, but regardless of how it came home with me, I know that I got it off of a spinner rack at a grocery store, where the comics were located right by the entrance and were the first things I saw walking into the store. It wasn't until I was about 16 when I actually stepped foot into a comic book specialty store with any regularity, and I was in college the first time I signed up for a pull list. In the years since, comics have mostly disappeared from grocery stores and similar businesses, and while online sales certainly are to blame for some of that, I'd say that the industry as a whole has suffered from this lack of an initial exposure point, primarily when it comes to kids. Comic shops are great, and I'm thankful that I don't have to run out to Foodland every week in hopes that they'll have the new Fantastic Four issue in stock, but they don't always attract a lot of first-time customers. You go to a comic shop if you like comics, not if you feel ambivalent or don't really know about them. In general, this is why I was excited when DC announced that they would begin selling four new books exclusively at Walmart. It allows potential readers - kids, specifically - an opportunity to see the books in a place they might already be. There are more Walmart stores across North America than there are comic shops, so I guess Walmart has just become the biggest comic shop chain in the world? Maybe that's a stretch, but I think it could be the biggest step forward for visibility since, well, the slew of comic book-based movies over the last 20 years. Even better, these four comics, Superman Giant, Batman Giant, Justice League of America Giant and Teen Titans Giant, are each 100 pages long and cost $4.99. That's a much better value than the usual 20-page story for only a dollar less. From a collectors' standpoint, just like anything new and unusual, this new program has sent a number of established fans on scavenger hunts to Walmarts across the country in search of these books. So Walmart is getting customers from both sides - comic fans will stop in to grab the new issues (and maybe buy some toilet paper while they're there), and new readers might pick up a book for the first time (while they're already there, buying toilet paper). I generally try to avoid shopping at Walmart for a number of reasons (all of which are probably too boring for me to write about here). But when the books were released on July 1st, I made the journey to the store and tried to find them, and without too much hassle, I managed to track them down. The books were located near the self checkout aisles, next to trading cards and other cheaper collectibles. I've love to see these placed with the other magazines by all of the lanes, but I guess this is an okay start. The books are housed in the above display, which I really like and want to own. Do you think that Walmart has, like, five of these in the back? Should I ask them to give me, a grown man in his 30s, one of their comic book displays? The display isn't very big, and probably holds two dozen of these 100-page Giants at most. I found all four titles, though I grabbed the very last Teen Titans issue. There were more Batman issues remaining than any of the other three titles, which leads me to believe that they had more Batman issues in stock to begin with. It's probably the most popular title, right? The image underneath the two front spaces is, I think, from Alan Moore and Curt Swan's "Whatever Happened to the Man of Tomorrow?" story. The whole thing is designed very well. I believe that, starting in August, new issues will be released during the first and third weeks of every month. At this particular store, there were also a few collected three-packs of comics in the stands, which featured the characters from the Giant titles. This is another great offering, as it gives people a smattering of other stories with the characters from the titles they might have just read and enjoyed. And these aren't just comprised of old stock - the title dress is slightly different from the titles that were released a few years prior. Here's the back of the three-pack bundle. It's basically just...an ad for the comics inside. Speaking of ads, at least two of the titles have the comic shop locator service listed inside. This should easily be all four, as all of the ads in these titles are in-house and for other collections, and it should be plastered on the inside front cover, but I guess this is a start for now. Oh, and it just so happened that Planters Cheez Balls just came back to stores on the same day. So this was a heck of a trip to Walmart! Can you believe it? 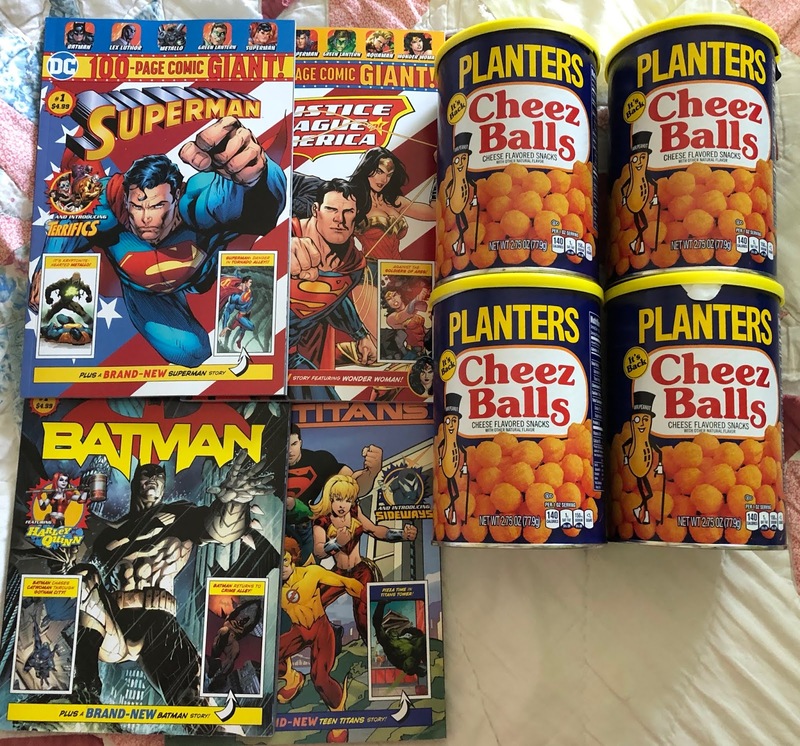 Cheez Balls are back, and comic books are in general stores! Things are looking up. I hope both of these are remarkably successful.